Michigan is in a three-wide set with Martell Webb lined up on the line of scrimmage on the weakside of the field (top of the screen) and Vincent Smith in the backfield next to Denard. 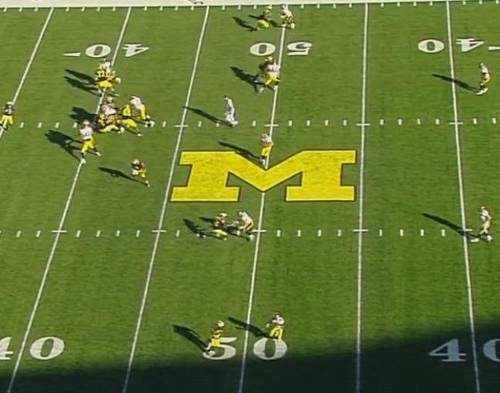 Iowa is in their base 4-3 set with an outside linebacker shaded over Roundtree in the slot. Iowa is in a cover-2 look. On the snap, all three receivers (Stonum at the bottom of the screen; Roundtree, in the slot; Hemingway, at the top of the screen) and Webb all release on vertical routes. Vincent Smith releases right away on a route to the flat. 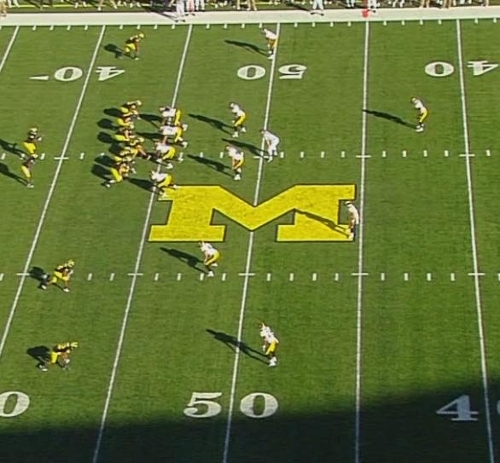 Iowa rushes four and drops seven men into zone coverage. 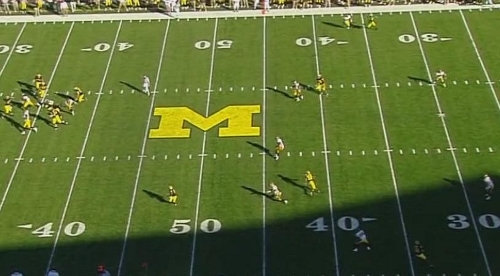 A moment later, Michigan's offensive line is falling all over themselves because of a defensive line stunt. (Michigan's offensive line has shown a significant amount of trouble handling defensive stunts. I expect to see more of them in the future, resulting in a lot of QB pressures. How Denard handles them will be critical to this team's success.) The two outside linebackers are engaged with their closest receiver (Roundtree and Webb) and are forcing them to the outside of the field. 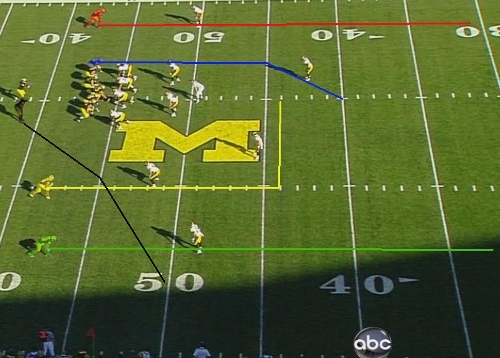 This is a really important moment and something that Michigan's defense can learn from. Smith is heading further into the flat and is getting more and more open. Denard is now feeling the pressure in the pocket despite one of the defensive tackles falling down. He begins to roll out to his right which effectively closes off the weakside of the field where he has his best matchup: Hemingway is running a fly route and Webb is running a post route, effectively splitting the weakside deep safety and making him choose one or the other. The playside OLB is still engaged with Roundtree and is pushing him to the boundary. The same is happening to Stonum on his fly route. At this point, Vincent Smith becomes the only viable option on the play as he rolls into the flat. Denard has now waited too long to throw the ball to Smith in the flat. The OLB that was engaged with Roundtree is coming off of him and defending the check down (the first down is at Iowa's 45 yard line, and Smith very likely wouldn't have made it there). Roundtree is going to run a square in at the Iowa 43 yard line. He will be covered by the middle linebacker in the middle of the field. Stonum, after being pushed to the outside, is basically bracketed by the playside deep safety and the playside corner. Smith is still Denard's only option. This screen is almost identical to the one that made me think last year's interception was Hemingway's fault. Stonum, who's at the bottom of the screen at the Iowa 35 yard line appears to be pulling up on his fly route. When Hemingway did this, I thought it was a misread by the receiver, but it appears that Stonum is pulling up because he realizes that he's bracketed and needs to settle in this zone, which I'll talk about later. Instead, Denard heaves up the same ball that he did to end the 2009 Iowa game, a pass that, like in this instance, would have been at best a jump ball against a deep safety. I believe that Denard has a few specific reads he has to go through that will determine who he throws the ball to. The first read is the deep, strongside safety, currently standing at the Iowa 45 yard line on the edge of the M. That safety is pressured by Roundtree (yellow) and Stonum (green) and is forced to make a decision: play the underneath throw on Roundtree's square in, or play the deep route against Stonum. The correct play is the make sure no one gets behind him, so when he keeps Stonum and the entire play in front of him, Denard should immediately check to his next receiver. 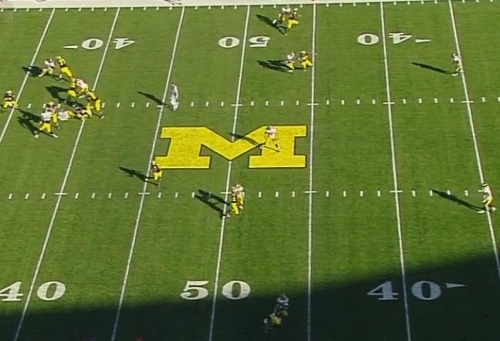 Denard's second read is whether or not Roundtree's square in comes open. The outside linebacker that forces Roundtree to the outside is also responsible--along with the playside corner--for the Smith release in the flat. 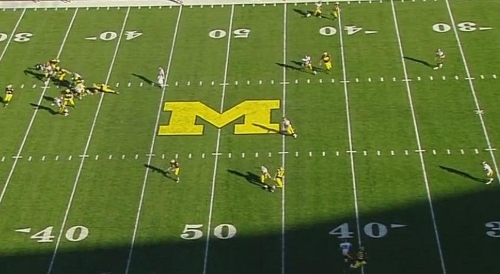 If the linebacker stays with Roundtree, vacating the underneath throw, Denard needs to check the ball down to Smith. But, and this is the read I missed on last year's play, if the playside corner comes up to cover Smith in the flat, Stonum will be open on the deep hitch route that we see him sitting down in. Instead, Iowa is content giving up the underneath route to Smith and taking their chances tackling him. At no point in this play was anyone on the strongside of the field open except Smith. One of the reasons why there were no open receivers on this play is because Iowa's linebackers and corners do a perfect job carrying receivers through their zones, and re-routing the vertical routes to take pressure off of the deep safeties. We've seen Courtney Avery attempt to do this, but he typically carries receivers too far. Michigan's other corners and linebackers rarely, if ever, re-route vertical receivers putting a huge stress on Michigan's deep safeties and resulting in Cam Gordon being victimized. Not only did the press of the receivers get them out of their routes and closer together horizontally on the field, but it also allowed the pass rush to get to Denard, who was hurried on the play. 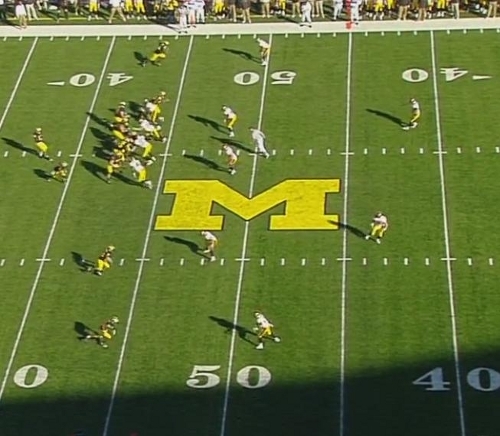 Because Denard was hurried, he wasn't able to completely go through his reads. This doesn't reconcile the throw he made, but given that Michigan needed a first down and Smith very likely wouldn't have gotten there, Denard decided that he had to throw the ball deep. Though seemingly a good idea, it also shows that Denard is having trouble getting through his reads and, like this instance, may be making up his mind before the play really develops. Regardless of the situation, however, Denard needed to check this ball down to Smith in the flat, even if he wasn't going to make it to the first down marker. And I believe he needed to make the throw much sooner than he eventually did.